Farmers from Navi Mumbai’s Nhava Sheva (Uran region) feel betrayed as PM Modi failed to fulfill his promise. Prime Minister Narendra Modi often talks about development and claims to be the angel of change. However, people from Navi Mumbai’s Nhava Sheva have a different tale about PM Narendra Modi’s promises to share. Farmers whose land was acquired by the JNPT-Jawaharlal Nehru Port Trust before almost twenty-six years have still not received the promised pieces of plots under 12.5 percent scheme. However, some of the parcels of land that they owned before three decades have been handed over to the builders by the authorities. Thus, these farmers feel that even the prime minister has cheated them by issuing fraudulent letters back in 2014. PM Modi had distributed the letter of intent to project affected persons. 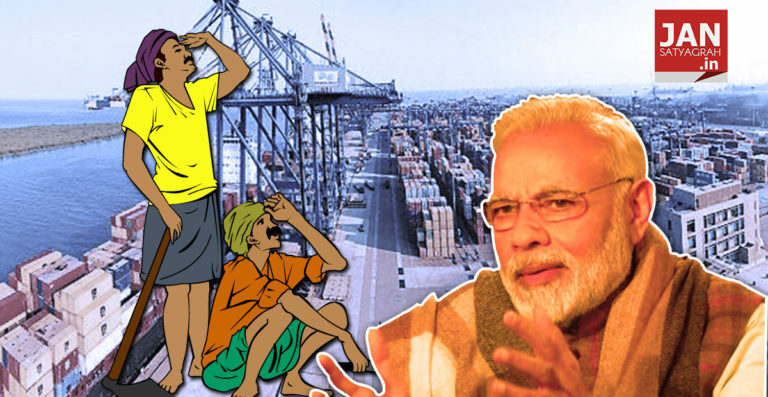 In August 2014, Prime Minister Modi had laid the foundation stone for JNPT’s port-based SEZ in Sheva, Navi Mumbai as well as the port connectivity highway project in Uran region. Union Minister for Road, Transport, Highways and Shipping-Nitin Gadkari, Lok Sabha MP Shrirang Barne, Union Minister Anant Gite, the then Governor of Maharashtra Kateekal Sankaranarayanan, and state’s CM Prithviraj Chavan were also present during the event. Documents under the 12.5 percent land return scheme were distributed to affected farmers by PM Narendra Modi himself during the event. The prime minister had promised the people that his government aims to develop the area under JNPT and Uran at a rapid pace. He also said the center was committed to solving all the project related issues highlighted by the then Congress CM Prithviraj Chavan. 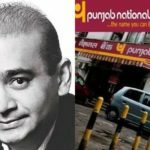 Now, the District Magistrate recently pointed out that the letter of intent (related to land distribution) distributed by the government were out of the legal framework. JNPT issued documents, and they do have valid signatures of officials. But, the DM claims they were not drafted and distributed as per rules. People have started ridiculing and laughing. Prime Minister’s punch line “sabka Sath, Sabka Vikas” helped him to earn a lot of praises. It also enabled him to win assembly elections in the majority states, including Maharashtra. However, the ground reality is that PM Modi has failed to offer anything beyond assurances to the farmers, just like most of the other leaders in the country. At one point, no one had guts to criticize PM Narendra Modi, but today, farmers are criticizing him for failing to fulfill his initial promises. These voices of descent are not good news for the party. Today, the BJP is at the center and also rules the state of Maharashtra. So, what is the point in electing the same party at the center and state if it cannot act in the interest of people and fulfill its promises made to the farmers, landowners affected due to JNPT project? There should not be any hesitation in pointing out that PM Narendra Modi’s image has completely changed during the last three years. Before around twenty-six years, farmers from Raigad district were forced to sell their land at dirt rate for developing JNPT. As part of the compensation, they were also promised that certain percentage of their area would be returned to them after developing the same. Children of some of these farmers are employed at the JNPT. 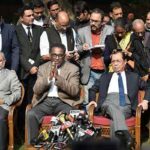 While interacting with journalists, people in Nhava Sheva area said that before 2014 assembly elections PM Narendra Modi had given personal assurances regarding the long-pending land allocation. Now, farmers feel betrayed due to government’s approach. They recently met Shiv Sena Chief Uddhav Thackeray and shared their grievances. People also requested the Sena Chief to look into this matter. PM Modi had assured justice to farmers. While laying the foundation stone for JNPT SEZ project, the prime minister had promised that his government would give justice to farmers as industrialization and agriculture need to go hand in hand. He had said his government would help JNPT’s shipbuilding and improve the ease of doing business factor to support all the industries that generate employment for the young generation. But most of these promises remain unfulfilled after three years. Eight-lane highway for better connectivity with the port. During the same event, Union Minister Nitin Gadkari had promised to solve the traffic-related issues in Uran and surrounding areas by converting the existing four-lane highway linking to JNPT project into an eight-lane highway. Gadkari had also promised to make special arrangements to park containers, trucks on JNPT’s premises. Besides this, the union minister had assured the people that he would construct subways to ease traffic at various locations in the region. The port handles more than fifty lakh containers each year and is considered as India’s busiest, as well as the biggest one. However, nothing out of Gadkari’s promises has come up yet. Land available for allotment is lesser than required? According to the people who know the details about the project, the overall land required to be allotted to the project affected persons is 146 hectares. However, the area available for allotment is 111 hectares. The plots that are expected to be allotted to the project affected persons are said to be in deplorable condition. The land has not yet been leveled, plus, it does not have proper roads, electricity and other amenities. Thus, people are extremely concerned about the way the government is handling the situation. Also read: How the profit of land is diverted into industries or charity? The views and opinions expressed in this article are those of the authors and do not necessa  -rily reflect the official policy or position of jansatyagrah.in. You may have dissent with  the author's opinions which can be raised by writing to us and the author.